**ALL drop in triggers are on SALE** Please view the trigger section HERE for the most up to date coupon code available! polished piano wire hammer spring provide reliable ignition and fast lock time. Made of wire EDM machined, hardened A2 tool steel and lightweight aircraft- grade aluminum. Extremely short takeup, clean crisp break and very short, positive reset. Non-adjustable 3.5lb pull weight, non-skeletonized trigger shoe and no bearings...but we’ll put it up against any trigger made - except our performance series utilizing sealed bearings. Ultra-Light housing is standard - Total physical weight of entire unit is just 2.3oz. Available with a curved or straight shoe. 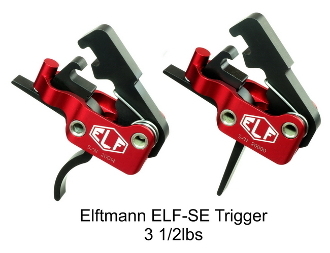 Click HERE for the link to the ELF trigger installation instructions.